Chaparral: The new OSX line is designed with entertainment in mind. Chaparral Boats unveiled its 300 OSX at the Chicago Boat, RV and Sail Show this week, its first in a new class of boats called Outboard Sport Luxury. The OSX seeks to combine a sport boat with the functionality of an outboard-powered center console, the company said. The company was trying to create a product the public didn’t yet know it wanted, said Chaparral senior vice president Mike Fafard. “Our purpose from the beginning was to do something completely different that would appeal to people on the coast, as well to push some of the outboard business inland to lakes,” said Pegg. 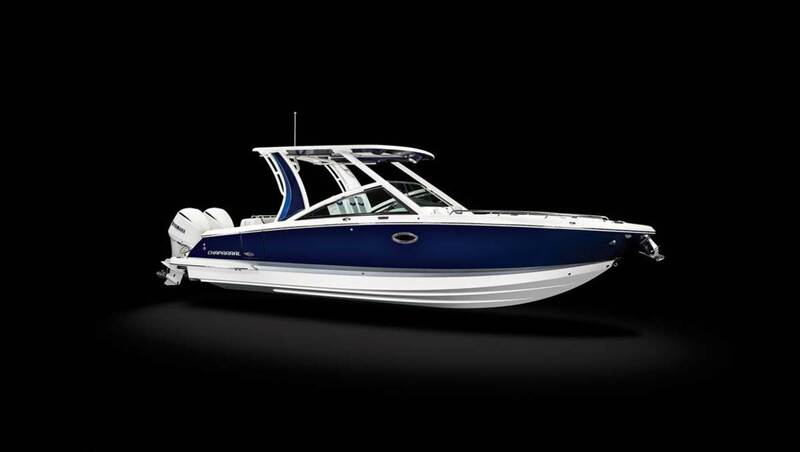 The boat was “highly anticipated” going into the August dealer meeting, said Ann Baldree, senior vice president of Chaparral. “A lot of innovation went into this boat,” said Baldree. The helm seat can be rotated from the navigating position to the starboard deck wall to create an open cockpit atmosphere. The boat is designed for entertaining with its wraparound sunpad. The helm seat can be rotated from the navigating position to the starboard deck wall, creating an open cockpit atmosphere for entertaining without compromising access to the cabin, according to the company. The “Vista View” lounge is designed to allow full-length lounging in the forward or aft positions, and the cockpit is covered with a large, integrated fiberglass hardtop system with lighting, bonded skylight, and optional SureShade. “The cockpit is all about entertainment,” said senior vice president Bill Pegg.